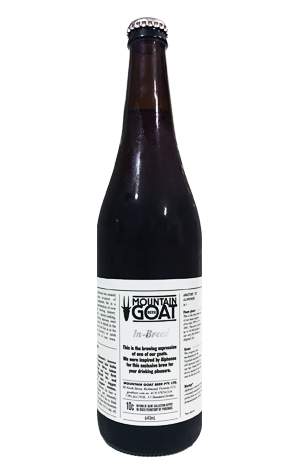 A few years back, Mountain Goat tapped a new beer at their brewery bar called Fancy Pants. It was intended to be what their iconic Hightail might be were there not financial realities to take into account, and it's fair to say that this hoppier, maltier version – then supposedly just a one-off release – was lapped up by The Crafty Pint and mates. Fancy Pants has since graduated to be one of the brewery's canned releases. At the same time, it's not a beer that retains such a "Wow!" factor in a beer world where tastes have evolved fast; indeed, it's probably viewed more as a sessionable amber ale. Enter Alphonse. On one hand, Alphonse is the rather impressive metal goat constructed of old brewery parts that calls the Richmond brewery home. On the other, it is the brewers' latest Hightail enhancement (adding to the Double and Triple Hightails of past anniversary years). In other words, it's an amber ale that's been souped up to the sort of level one probably needs to go in order to achieve the same reaction today that the first Fancy Pants did. Thus it features half a dozen specialty malts plus a combination of English and American hops. And, while those hops do their thing, offering some citrusy, spicy elements, it's the malts that are the stars of this India amber ale. In fact, the lusciousness derived from Kiwi maltster Gladfield's goodies is reminiscent of last year's Naz Scotch ale in its toasted, rich toffee and raisin like fruitiness, albeit delivered in a leaner body and with a more pronounced bitterness. A worthy doff of the cap to its forefather.